All week I'd been planning a nice Cairngorm trip - into Lodge and do a Braeriach traverse with some other tops along the way. Supposedly a 3 day walk/camp job. Then the weather gets its oar in things and a miserable, foggy, snowy time is foreseen in the East, with better weather, surprisingly, in the West. So on Thursday morning I have to make new plans, think about where to camp - oh the bother of it all! 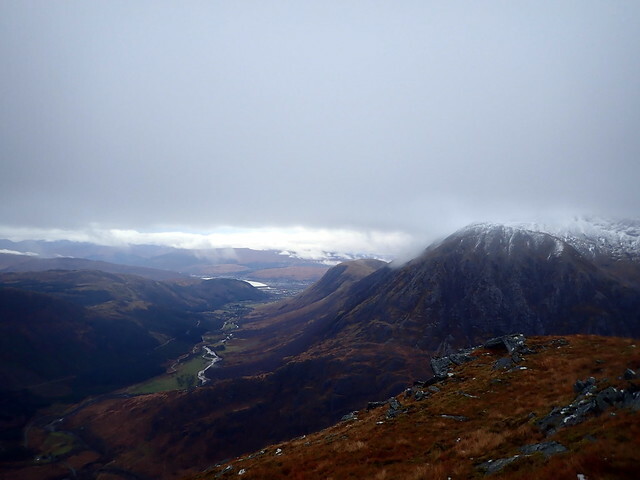 So I decided upon the Ring of Steall for Friday, the Grey Corries for Saturday and see how we feel on Sunday. At least we'd get a walk in done on Thursday night - parked near the lower Glen Nevis car park and walked the couple of miles to Steall Meadows. We'd been here last in July, when there was a tent village - tonight there was only us. 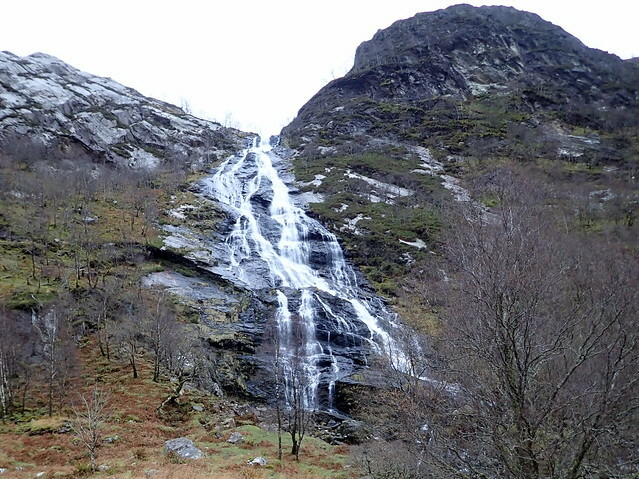 We camped on the lovely flat ground beside the wire bridge and had a most restful night's sleep with the cascading Steall Falls to sing us lullabies. We didn't rise too early on Friday - out of bed at 8 and ready to go at nine. Crossing the wire is an interesting way to waken up, especially with a big pack on your back altering your centre of gravity. Then it was into the bog - quite squishy there. 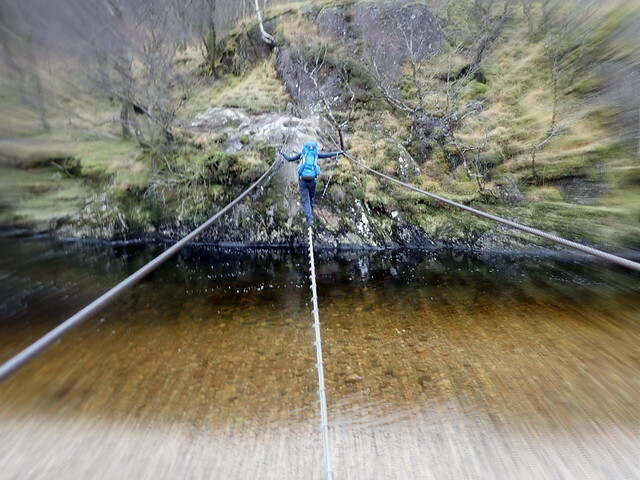 More trouble was had crossing the river at the foot of Steall Falls - the rocks were slippy enough to make this difficult, the water level high enough to promise wet feet. 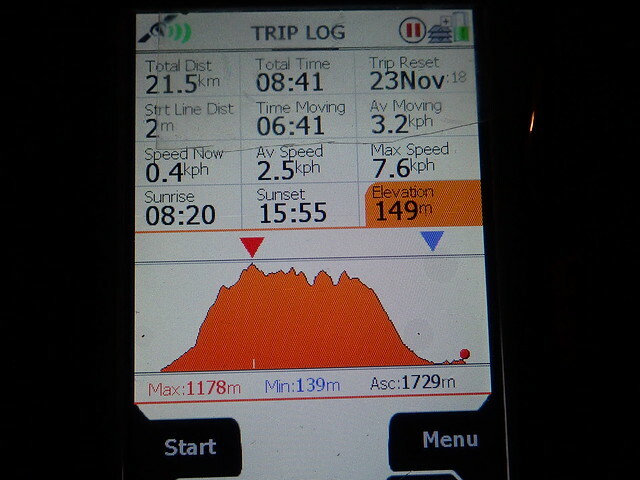 Over at last and then the long slog up to An Gearanach. 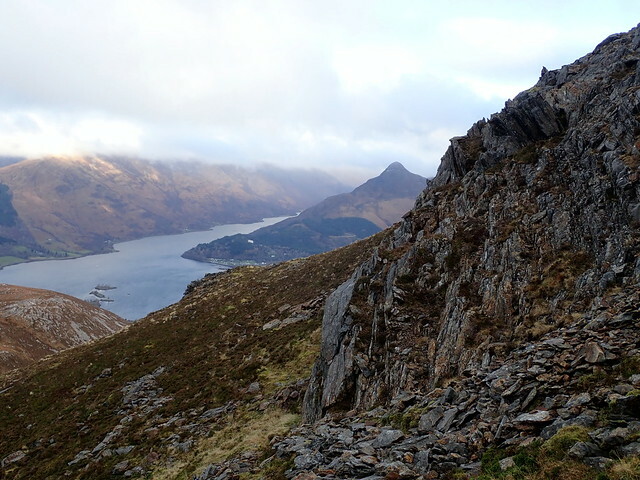 We fair romped round the ring 5 months ago, then I went on to climb Sgurr nan Coireachan - none of that zip today. 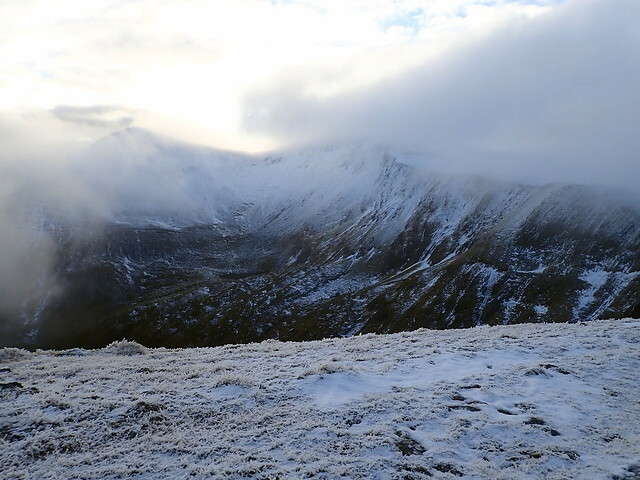 As we climbed about 500m the clag closed in, after 850m there was a light covering of snow on the ground. 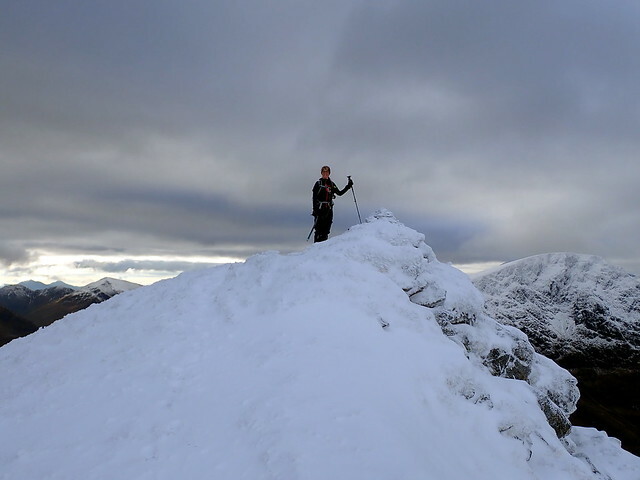 Top of An Gearanach - which way now? 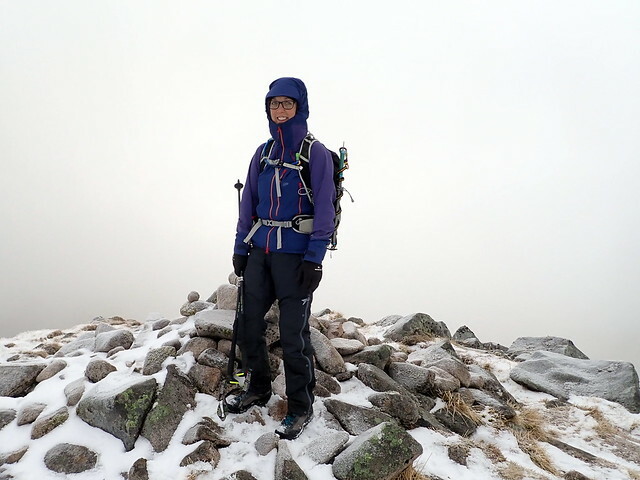 Arriving at the summit of An Gearanach, we prepared for the slippy scramble along to An Garbanach - not as much fun with big packs or when there's just enough snow on the rocks to make your footing uncertain. 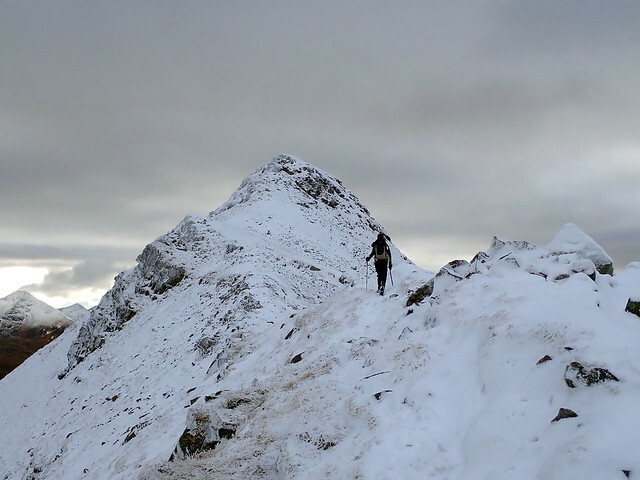 The route to Stob Coire a'Chairn was less clagged and quite enjoyable. Then the bigger pull up to Am Bodach. 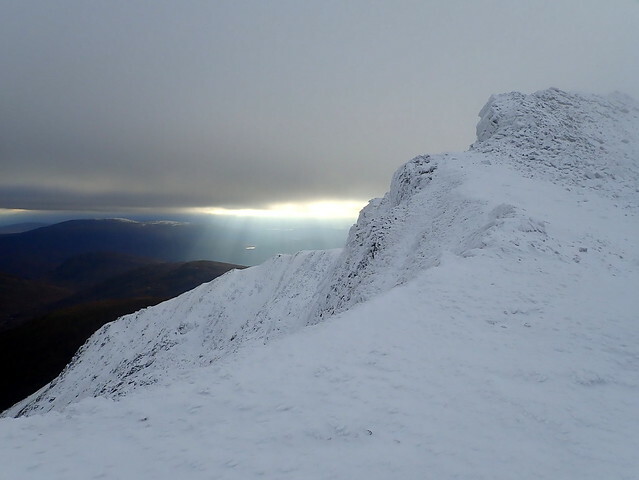 This was my 250th Munro of 2018, a target I felt quite chuffed about reaching. Onwards to the unfairly demoted Sgurr an Iubhair then I sent us the wrong way, heading down towards Lochan Coire nam Miseach rather than to Stob Coire a'Mhail, don't ask me why I thought the ridge to Sgurr a'Mhaim started from there. Allison's "spidey-sense" picked up the wayward journeyings quite quickly, so we didn't have too much re-ascent to undertake. 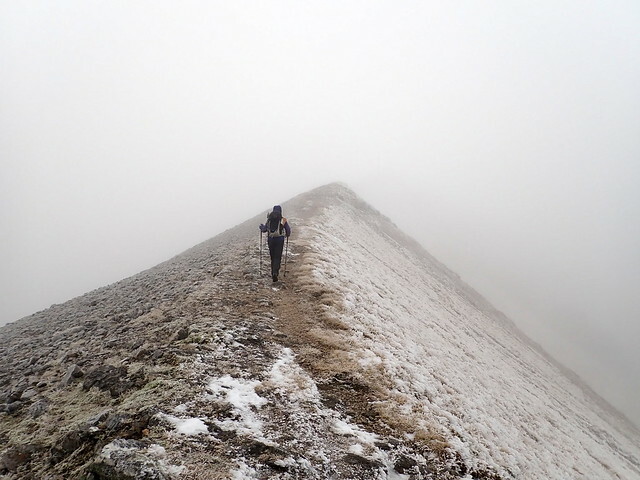 Back on the Devil's Ridge, we chose to bypass the one scrambly section going down to our right, primarily cos it's a little awkward with a big pack on. Onwards to the summit then an interminably long descent back to the car park, where we didn't arrive til 4.45. In the dark we unpacked then drove along to Coire Choille, where we'd decided to spend the night in preparation for the Grey Corries. We pitched (eventually) by the lower car park - a spot we'd used before but I managed to find a slab of rock under the grass with at least one of the 4 corner pegs each time we moved the tent - took a while to eventually get a satisfactory pitch. The bonus was a very peaceful night, with only the sudden scream of a barn owl around 5am to disturb us. 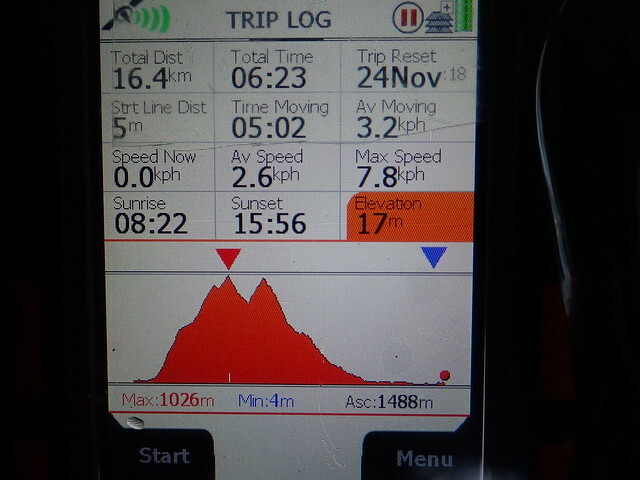 Up by 7 the next morning and away on what would be a longer day by 7.45. 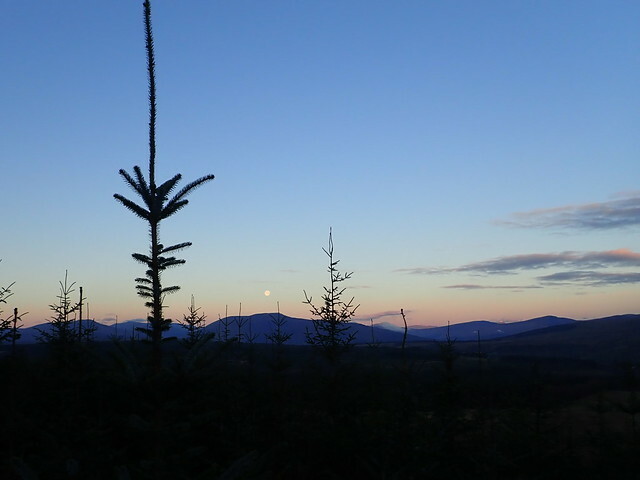 The moon was still full in the sky to the north, a baby pink glow waiting to be burned away by the arrival of the sun. 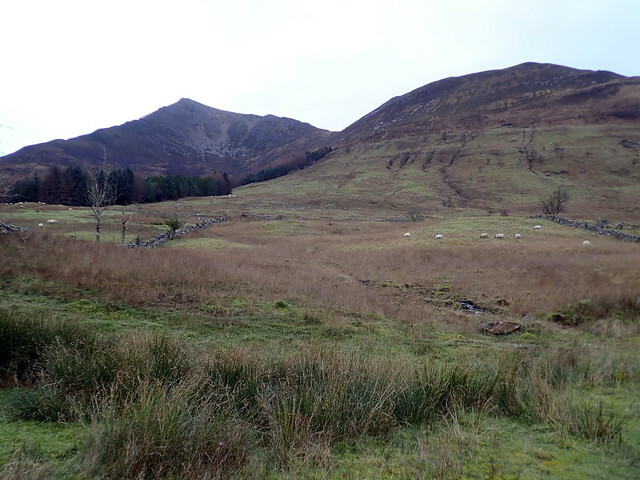 I'd decided we'd do the Corries in a clockwise direction - last twice has been anti-clockwise, but I knew we'd be short for light at this time of year and thought it would be better walking through the woods in the dark rather than coming down from Stob Coire Gaibhre. A couple of carloads of guys arrived as we were setting off - not sure where they ended up. 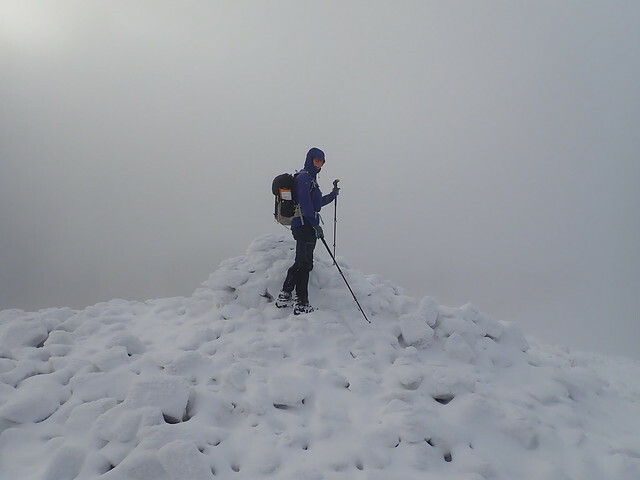 We enjoyed another long slog up a steep slope to the 958m summit of Gaibhre, a good covering of snow underfoot. 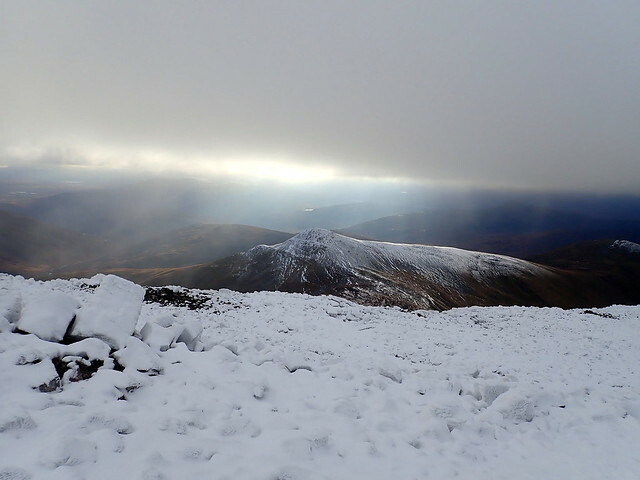 Mist and sun combined to make Coire na Ceannain a mystical place. 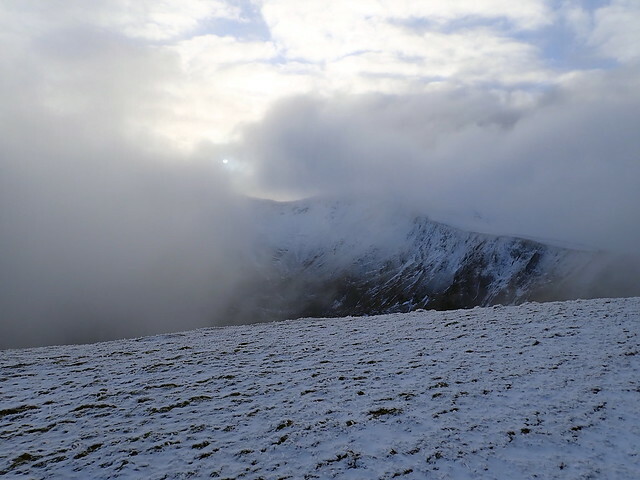 A ceiling of cloud lay just above the mountain summits, but the weather improved steadily as the morning turned to afternoon. 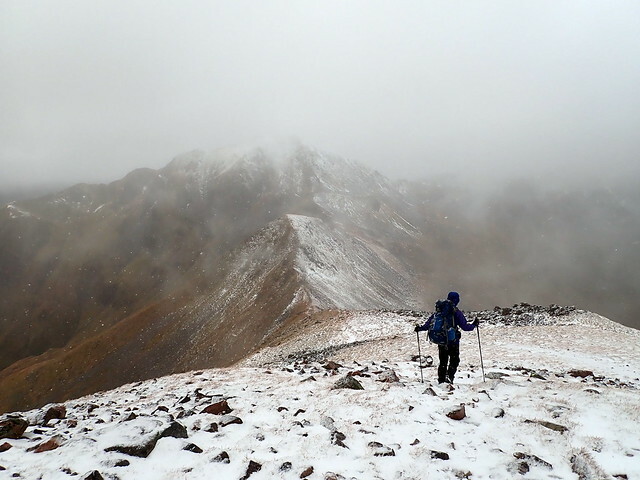 The whole ridge lay ahead of us, glistening in new snow. 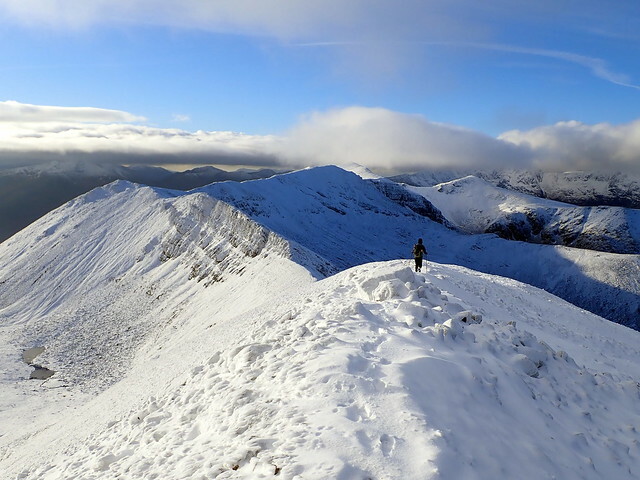 I've not climbed the Corries in Winter before - but they make a splendid walk for a day like this. 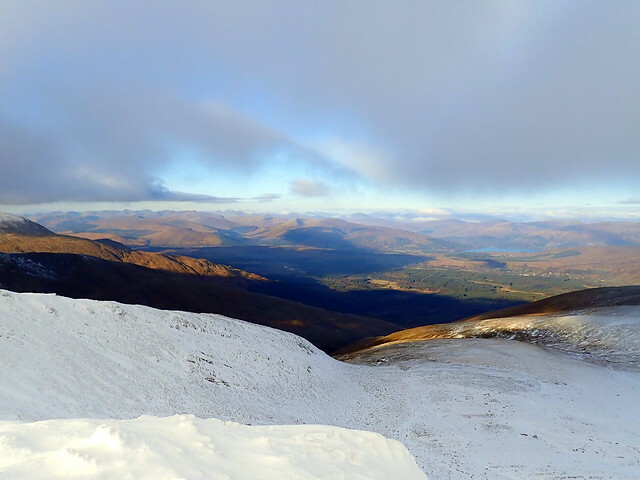 Over to the west, only Gairich had the lightest dusting of snow, all the other tops were snow free - it was as though winter prevailed east of the A82 and it was still autumn beyond. 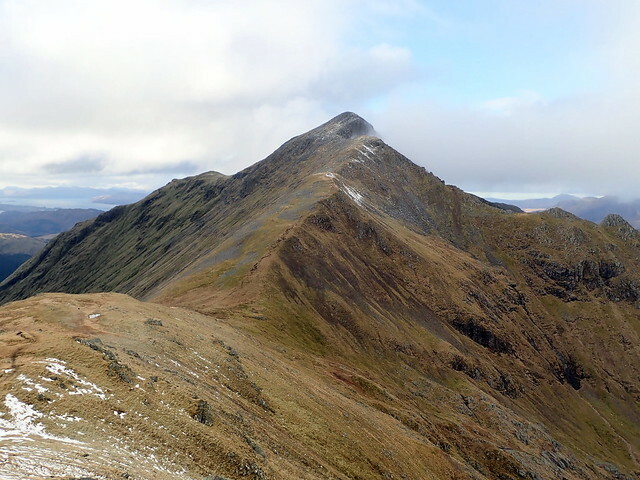 At the far end of the glowing white ridge sat the shapely form of Sgurr Choinnich Mor, our final target for the day. 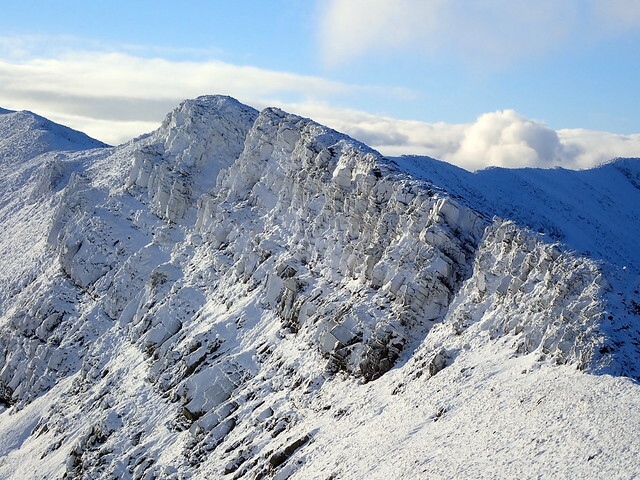 The snow made intricate patterns on the corrugated face of Stob Coire Cath na Sine. 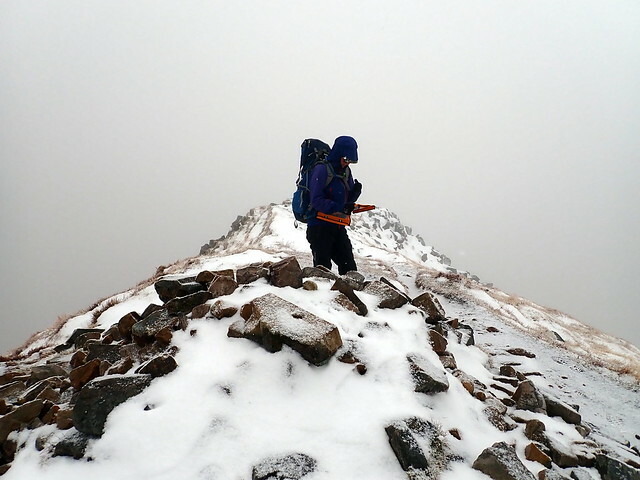 Eventually, we arrived at Stob Coire Easain, with a blocky descent to Bealach Coire Easain and 150m re-ascent to the top of Sgurr Choinnich Mor. 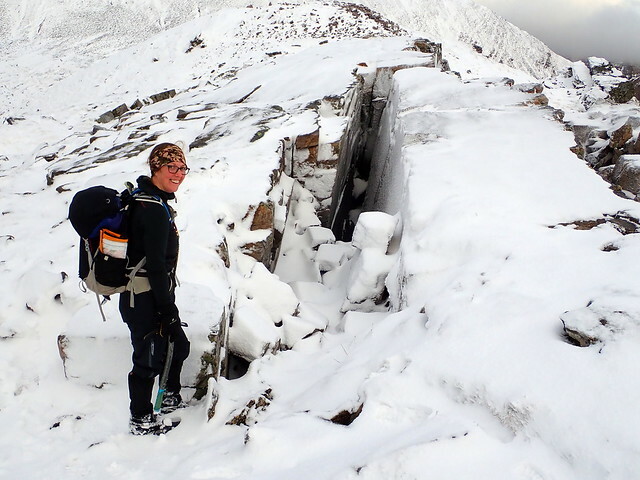 The final section had me a bit uncomfortable - I hadn't minded the narrow path in dry/non-snowy weather, but even with ice axe I felt uncertain on the path with just enough slippy snow to make footing unreliable - and knowing that you were toast if you did happen to slip down the east side. 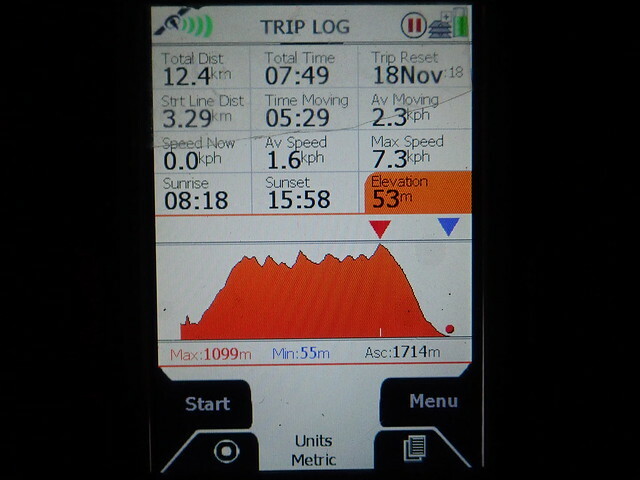 I got to the summit, took my usual summit shot then quicky about-turned and got off the steep bit of the hill. We met a group of 3 guys coming up as we re-crossed the bealach, no axes, hopefully headtorches as they were going to be 45 minutes later than us. Back up to Stob Coire Easain then the long gradual descent over the back of Beinn na Socaich. I don't know what GPS route I was using, but for some reason it led us down to the dam over the Allt Choimhlidh and onto a hydro track which did meet up with the route we were expecting. What's another river crossing at the end of a long day? We wandered back through the woods as darkness fell, passing some tree fellers knocking off for the day. Managed to make it back to the tent without requiring the headtorches - just becausse there was a good path to follow. I was hoping for another quiet night - however about 8pm another car arrived and eventually set up tent across the field, after much opening and shutting of car doors. Around 11 a second car drew up, presumably their mates. 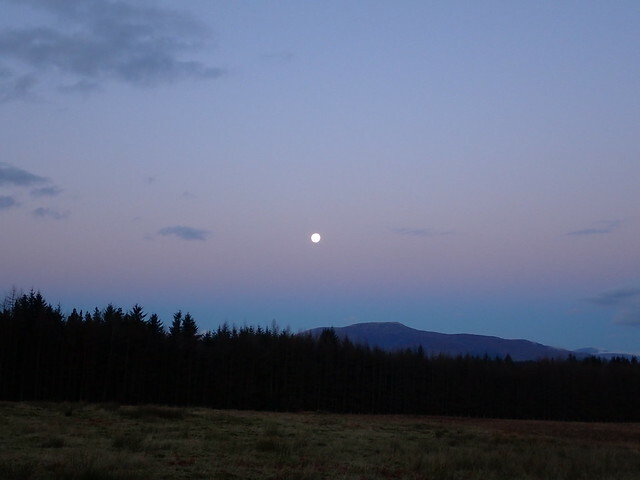 There was much exclaiming about how light it was - and indeed it was very bright, with a full moon illuminating the landscape, certainly enough to walk under. Down at the farm, a small yappy dog was going berserk and barking frenetically, which caused me to have some non-vegan thoughts about what I wanted to do to the pooch. Must have drifted off eventually. The tent guys were up and away to the hills before 6am, hardy souls that they were - whilst we lingered til after 7. We'd decided to do Beinn a'Bheither, convenient in that it was on the road home. Much less snow on the tops south of Glencoe - we parked in the village and set off up the standard route, much to Allison's dismay - she'd wanted to do Schoolhouse Ridge again. We spotted a couple of guys ahead of us, and there were two young lads coming up fast on our heels, one wearing Timberland boots. 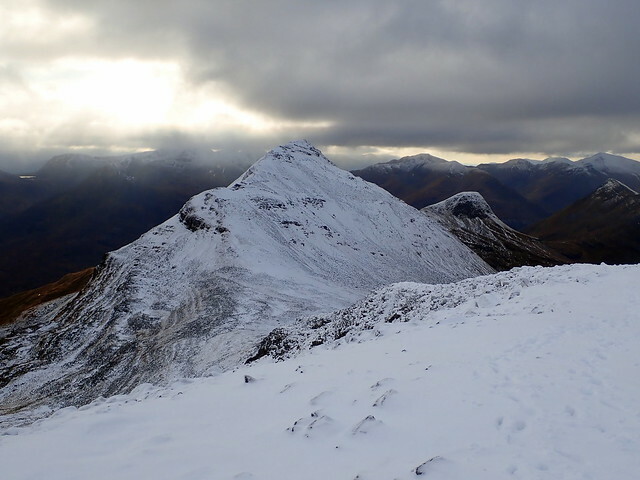 By the time we were half way up Bheinn Bhan I was regretting my decision about not going up via Schoolhouse Ridge - it would have been more fun. 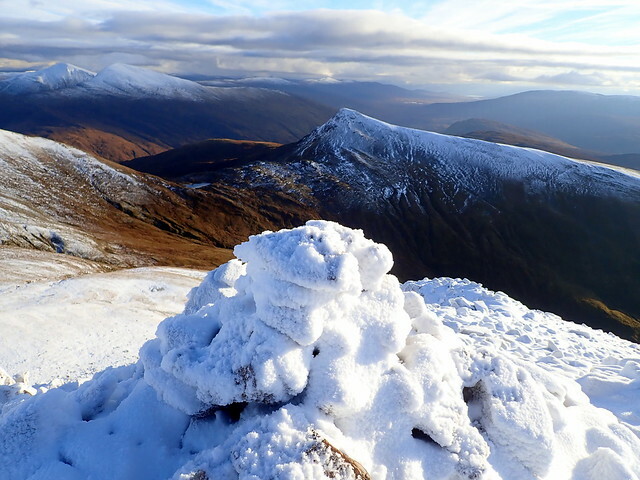 Anyhow, the spindly top of Sgorr Dhearg was attained, more snow on the SW shoulder than elsewhere. 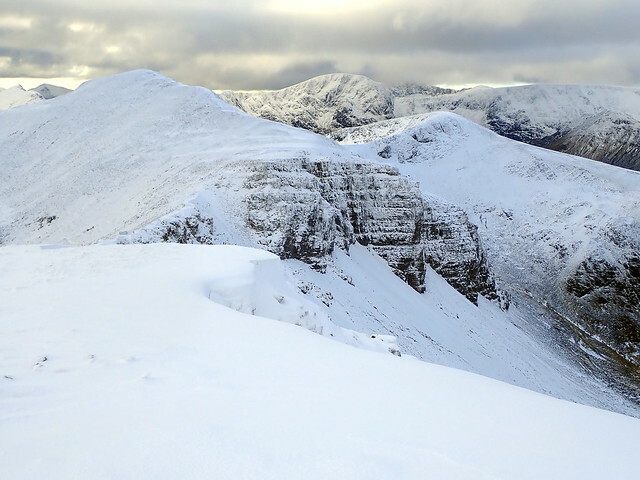 We paused for lunch near the bealach, watching the young lads head on up Sgorr Dhonuill, a virtually snow free mountain. 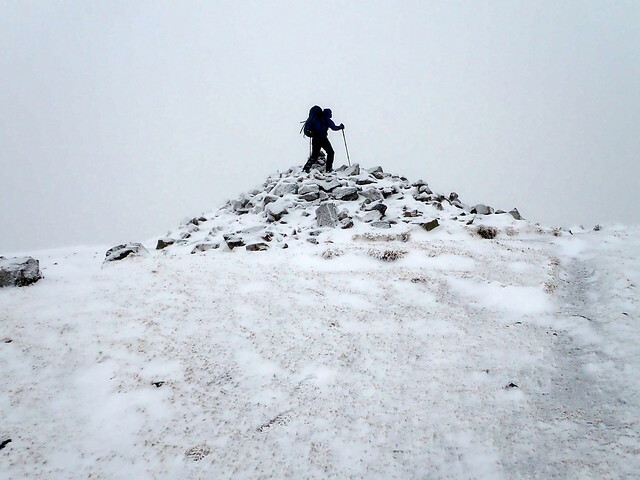 We chatted to the two Germans we'd passed earlier, then set off up to Summit number two. On the way up we stopped to view a Brocken Spectre and had a chat about it with the young lads who were on their way down - they'd only ever seen photos of the phenomenon before. 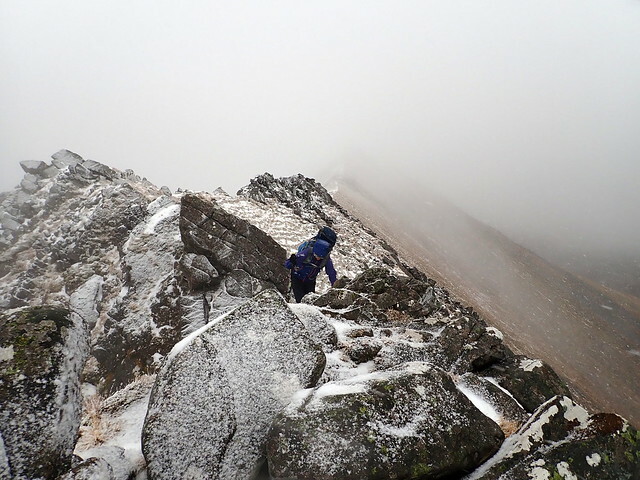 They warned us to be careful, it was "very scrambly" up near the summit. Sweet I guess we looked like a couple of old dodders to them. After managing to survive summiting Dhonuill we retraced our steps to the bealach. 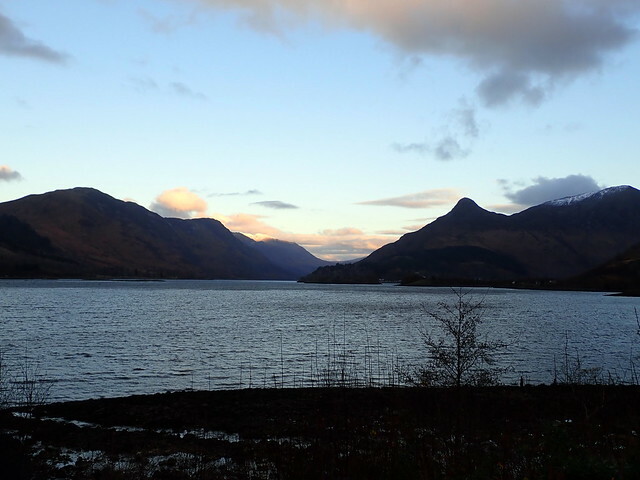 I had thought about continuing the horseshoe west down to Creag Ghorm but the arrival of thick clag at the top put paid to that - pity, as when i got home i found there are 3 Simms down that side. Och well, another time. In any case I managed to prolong the route by following the signs to the car park, which brought us out at the golf course, well away from the village centre. 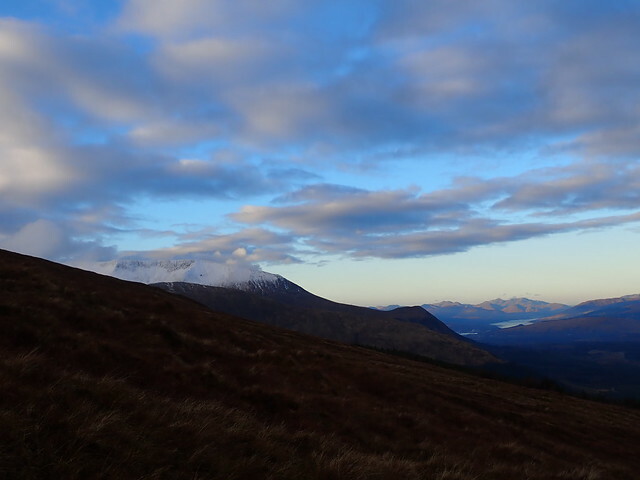 But it was a pleasant afternoon, the sun having returned, giving good views across to the Mamores. 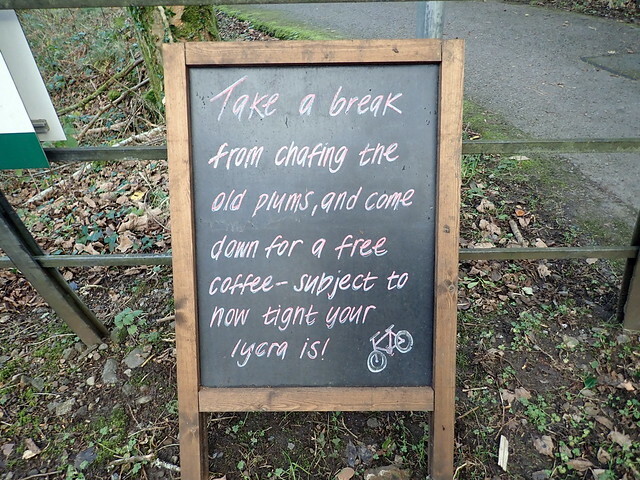 Interesting notice - I'm sure falls foul of some advertising rule or other!! 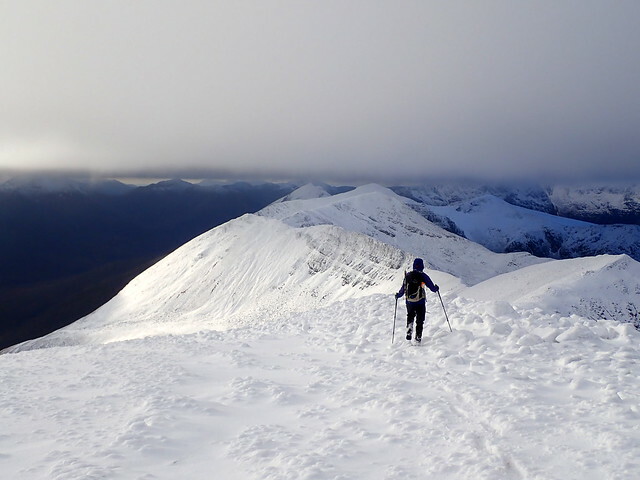 So yes, three cracking routes for a winter's walking - would have been nice if Beinn a'Bheither had a bit more snow, but I'm not complaining.